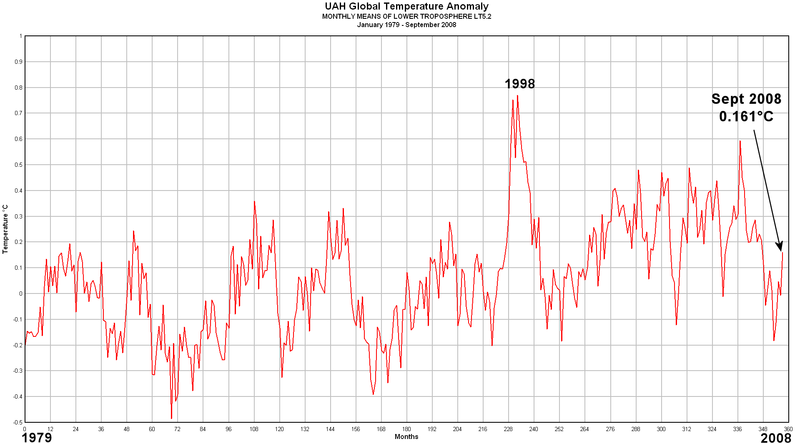 UAH Global Temperature Anomaly Jumps in September | Watts Up With That? UAH (University of Alabama, Huntsville) Microwave Sounder Unit (MSU) lower troposphere global temperature anomaly data for September 2008 was published this week and unlike August, which moved a bit below the zero anomaly line, with a value of -0.010°C, (down from 0.048°C in July 2008) we now have a significant positive jump to 0.161°C. That makes it the warmest monthly temperature this year. 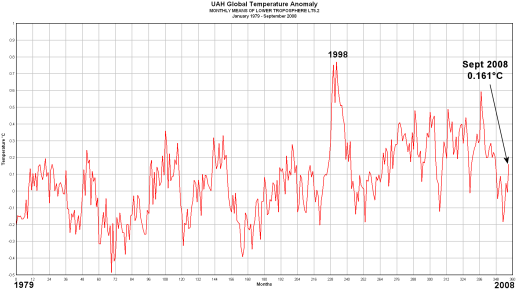 The global UAH ∆T from August to September 2008 was 0.162°C and is 0.040°C, slightly cooler than in September 2007. The biggest came came in the southern hemisphere, which went from -0.185°C to 0.102°C in September, a gain of .287°C. October 8, 2008 in Climate_change, Science. I predict that October will be colder than last year. I figured that September would come in warmer than last year based an a risky guess due to what it did here in Wallowa County (it was warmer than last year). October is coming to us courtesy of old man winter. Last night the temp fell to 26 degrees in the Valley (with no freeze warning from NOAA). It is expected to stay at that level each night. Temps are consistently below last year so far this October. So I will go out on a limb again and predict lower temps for October based on our Enterprise data. aaagggghhhh – a record increase in temperature over the past four months!! We are doomed, I tell you, doomed; we will all die!!! Anthony, you do know RSS is out as well, right? While we have rebounded slightly and Sept is the warmest month of this year so far, it was still cooler then just about every month in 2007. The SOI is going more and more positive, and I expect another strong La Nina this winter. The uptick for September has not significantly changed 2008’s position in the rankings. I still have it ~#20. The 12-month running average is lower than anytime since 2000. This result is to be expected. Last September La Nina had taken a good hold. This September La Nina has been dead for four months. Forgot to mention that the 10 year UAH anomoly trend line is at about .2C. So September is still below the trend line. In the last few years, the impact of the ENSO-El Nino-La Nina phenomenon on global temperatures has become much more clear. The strongest El Ninos can increase global temperatures by about 0.5C (maybe 0.7C). The effect is lagged on average by about 3 months. A La Nina, as well, can decrease global temps by about 0.5C as we have seen with the UAH temp data over the past 18 months. Starting in about 1976, the ENSO shifted to more and stronger El Ninos. This temporarily increased global temps by up to 0.5C (but probably less since most of the El Ninos were average in strength). The most important thing to note from this is how it affects a basic least squares trend line calculation of the data. The UAH temp trendline and the chart itself is slightly positive but at least half of this increased trendline is just because there was more El Ninos affecting it in the 1980s and 1990s and early 2000s. Now that we are into a neutral ENSO, temps are back to the level that would be expected with a very low global warming impact from CO2 level. UAH is up over the last few months because there was a La Nina in 2007 and early in 2008. Now that we are in neutral territory, temps bounce back a little bit. but they are still far, far away from the temps that the models predict they should be at. We should be at about +0.85C in the UAH anomaly if the models are correct but we are only at +0.16C. The latest satellite pics of the ENSO region show that La Nina is starting to build back now as the trade winds have picked up again. The warmers will have to revise their models pretty soon since we are not seeing the warming they have predicted. Bill, it is worth keeping in mind the estimated pre-industrial warming coming out of the LIA. Anything around a +0.1K/decade trend of non-anthropogenic warming (which wasn’t unusual pre-Mann98) causes complete havoc. Oh good, now it rises, now that the summer’s over and we’ve had our killing freeze. It’ll probably head back on down during the depths of winter, just to make things interesting. What is unusual is for a cooling apple pie to start heating up again!! Bill Ilis – Actually the 0.2C / decade number is for the next few decades of this century. To look at what the models were projecting before that we can use the numbers from the TAR. These are baselined in 1990. Taking scenario A2 as representative : temperatures from 1990-2010 were forecast to rise 0.35C, a linear trend of 0.175C/decade. The actual trend since 1990 as measured by UAH was 0.171C / decade. Several people have attempted to remove ENSO effects from the data to reveal the actual underlying trend, notably ‘Waiting for Global Cooling’ by Robert Fawcett published by Bulletin of the Australian Meteorological and Oceanographic Society and also Thompson 2008“. To John Phillip. CO2 has been increasing at 1% per year since about 1850. Why would its impact only start in the decades ahead. The 0.2C per decade trend should have been evident since at least 1945 when CO2 started rising at the modern rate. The ENSO corrected temperature analysis from RealClimate you linked to is a complete whitewash that unfortunately looked good enough that people bought it. But it is a whitewash. I said above that a strong El Nino can increase global temperatures by 0.5C. The 1997-98 El Nino increased temps by as much as 0.7C. What does RealClimate do to the 1997-98 El Nino – a correction of 0.15C. The analysis just tries to preserve the increased ENSO caused trend in temps that would have been caused by GHGs. Look at it again. 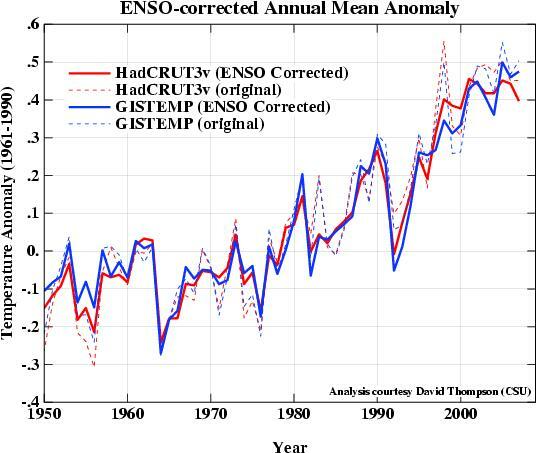 There is nowhere near enough correction applied for the ENSO effect. In terms of the UAH trend since 1990 at 0.17C. Mount Pinatuba volcano erupted in June 1991 which dropped temps by 0.5C which again artificially increased that trendline if you start in 1990. If you start measuring the UAH trend in 1997 before the 1997-98 El Nino started, the trend is 0.0C per decade. If you go ahead and make it a full 2 decades back to 1988, the trend is .158c/decade, and back to 1978, .128c per decade. Of course the last decade 1998-2008, a .005c cooling trend. Considering the PDO has switched to “cool” mode, the next 2 decades could cool down. oops, a correction…that would be .055c cooling trend. Enterprise, Oregon low: 22.2 degrees at 3:39 AM. Last year’s low 36.8 degrees. Once again, the NWS at NOAA failed to predict the freeze (they said they thought it might happen but it was not a warning). There is now a freeze warning for west of Wallowa County. And yes, here in Pendleton which is west of Wallowa County, there is a bit of frost on the pumpkin but I am far more worried about frozen pipes, not frosty pumpkins east of here on my ranch. I am 80 miles away and have no time to run up there and turn on the pipe heaters that sit under the house. It will definitely be colder for October and I am willing to wager. Now if I can just convince a cop that I needed to put my studs on earlier than allowed so that I can get through the mountain passes every weekend. Damnable global warming. Ah, nearer to the A1F1 scenario (rapid economic growth, emphasis on fossil fuels) then. The theory that man-made GHG’s would generate positive feedbacks, has gone into a coma. Every day that passes, without signs of life, brings it closer to the end. Can it be shocked back into life, with additional funding and a much needed super El Nino? Is it destined for cremation and the ash-heap of bad science? 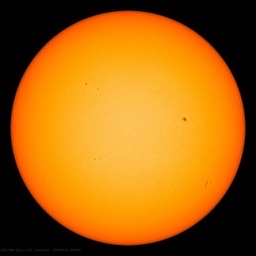 Again, very similar to the mid 90’s during the last solar minimum. If solar cycle 24 is a low amplitude cycle, will be interesting to see how the Sat temps pan out over the coming years. I have a feeling this will probably be the highest spike for the next few months. Arctic ice seems to be rebounding even quicker than last year. Getting cold fast and it’s going to make for one heck of Winter season for the eastern 1/2 or 2/3 of the the U.S..
Has anybody noticed that the anomaly for USA48 took a big drop? Northern ExtraTropics Land also took a big drop downward. The upward jump here appears to have been driven largely by a jump up in SST’s. For instance, NXT Ocean goes from 0.26 to 0.43. Now I know this is just a snapshot, but it sure looks to me like the intensity of the reds and yellows is less in the September image than in the August image. That doesn’t square with the big jumps I’m seeing in the “Ocean” components of the UAH September numbers. Could there by a problem with the UAH September numbers? Looking at HadSST2, NH SST’s were up a little in September, but not as much as UAH shows. Could this be explained simply by the difference between surface and troposphere conditions? E.g., did the troposphere over water warm up more than at the surface in September? So what caused it to cool down while the oven’s still on? On the assumption of ‘eso no es un problema’, the upturn indicates dumped heat over the month. The models, whatever their limits, are turning south. Wouldn’t we expect, then, less intensity in a snap? Pingback: Sea ice extent recovering quickly « Watts Up With That? Good analysis, unlikely outcome (honest candor). So, september is still on the cooling track that began in 2005 (after the 2004 big dive). Ground : with the weak sun, there might be a kind of heat redistribution between surface and low atmospher – even adjusted, flaw GISS data are flatening. Seas and oceans’ surface : september was hot in north Pacific and other areas. It is cooling back now. It is quite probable that oceans gave a little heat back before a new Niña. Given that UAH is baselined (zero-ed) on the mean temp for 1978-1998 and the model-projected trend is in the region 0.2C / decade, a +1.3C anomaly now would mean that ‘they’ would be forced to admit that the models had drastically underestimated the rate of warming. (sigh) If you have been reading this blog over the last year or so then you should be familiar with the words ‘La Nina’. Could the hurricanes explain it? i.e. by a transfer of heat from oceans to atmosphere. I’ve no idea if the manitude of the heat exchange is sufficient to account for the discrepancy over an entire month and on a global scale. I thought the oven had been turned off – or so a number of posters have been claiming particularly on the solar-related threads. Many have been saying that significant cooling is already underway and this will continue for several years so ending the AGW party. I think they are going to be disappointed. The September 2008 anomaly may have been +0.161 but it was still cooler them then September 2007 anomaly of +0.201 degrees. That marks the 13 consecutive month of cooling temperatures. Mary, 03:03, It appears a glacier from ‘La Nina’ cut the gas line to your oven 450K years ago. If you had been reading this blog over the last year you would know the only reason the oven appears to be on occasionally is called ‘El Nino’. It is interesting people can hold onto their faith in CO2 when whatever its effects are, are totally overwhelmed by these babies. Does the UAH do a data adjustment for UHI? I know this isn’t surface temperature measurements, so I’m just wondering. Ice covered, packed snow in spots and no studs. Damn, damn, damn! Maybe Gore will buy my “studs on too early” ticket as a carbon credit. And at the end of the La Nina it starts warming again! Looks like you just answered your own question. That will be due to the La Nina which kicked in just over a year ago. Now it’s over we should see a gradual rise in global temperatures. I reckon we’ll be back to early 2007 temperatures within ~6 months. Nope. 2008 will see colder temps than 2007. La Nina, La Nino, and any other nina/o that we haven’t discovered yet is small potatoes compared to the PDO which drives such events. Ever put your foot in the Pacific Ocean off of Oregon when it is in its cold phase? Think rapid freeze dried toes. Wow!! Century long El Nino, that explains everything…. Nope. 2008 will see colder temps than 2007. I never said 2008 would be warmer than 2007. I said global temperatures would be back to early 2007 levels within about 6 months, i.e. spring 2009 will be approximately as warm as spring 2007.
several degrees above above average over the last week. As I write this I’ve been listening to the UK weather forecast and we’ve got more of the same. Temperatures well above average for the coming week. Actually Mary, all that has heated up is the result of whatever algorithm that James Hansen uses for his GISS once per year output for his department budget which he calls anomalies. Other people’s too of course; but it would be a mistake to compoare a GISS number with anything else but another GISS number. One thing is for sure and that is that it is NOT the mean surface temperature of the earth. It is actually the result of a sort of religious ritual; like the Catholic priest ata funeral walking around swinging a brass pot emitting smoke and waving it a round. His Congregation compar what he does with every other time they have seen him do it; or maybe they remember what they may have seen in a Russian Eastern Orthodox church. so long as the ritual doesn’t change, everyone is comfortable, even though they have no earthly idea what it means. Same with GISStemp, it has no real scientific significance; except how it changes from previous observances of the same ritual. But it doesn’t tell anybody whether the planet made a net gain in energy or a net loss, or stayed the same. The peak spectral radiant emittance from the earth surface varies as the fifth power of the temperature (K), and the peak wavelength shifts inversely as the temprature changing the influence of the GHG absorption lines, and the total radiant emittance varies as the fourth power of the temperature. So averaging the temperatures of a selected few spots on the earth, and places that have constantly changed ovet the years, both in numbers and local environment serves no purpose but to perpetuate the religious ritual. And the thermal processes that occur for different terrains, like open oceans, tropical rain forests, Arctic ice sheets, or tropical deserts, are not simply related to the local temperature, so again no purpose in averaging. It is like having the World Wildlife federation taking a survey of the worlds animals, and counting the total number of animals per square km all over the world. the numbers for elephants, and locusts ar egoing to be quite different, so nothing is learned by averaging all of them regardless of species. Same goes for sampling earthly temperatures. No scientific validity to that at all; just repeat the ritual the same way, and people will compare it to your last celebration. Why is it when trying to argue their very weak position with pseudoscience, people like this always try to paint the other argument as a religion. This is a typical pseudointellectual response from a typical denier. Often we make the mistake of thinking what we are experiencing locally is happening on a global scale. I accept you may be experiencing cooler than normal conditions, but over here in the UK I spent this afternoon sitting in the garden on what was a gloriously warm day. Is this the same UK that just had it’s first October snow in 70 years?